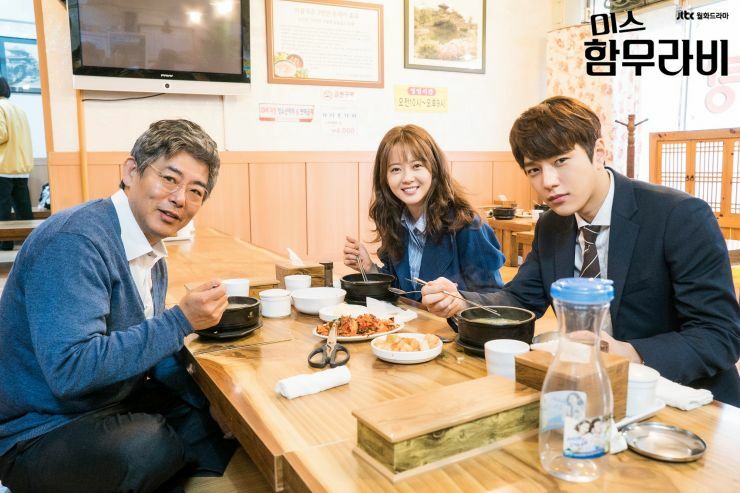 A realistic and humanistic drama about Judges, Miss Hammurabi premieres with a positively fresh start. 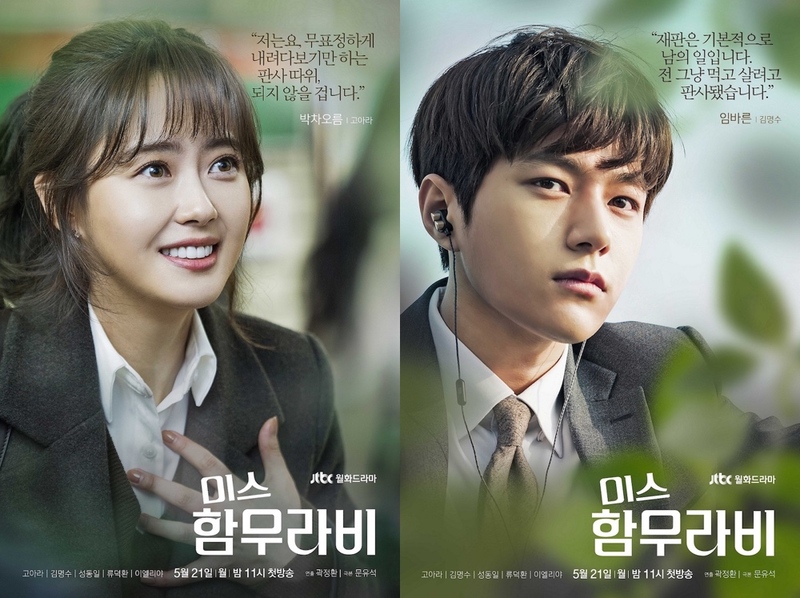 About the lives of Judges and their courtroom cases, Miss Hammurabi centres around three Judges with stark personalities and ethics. Park Cha Oh Reum (Go Ara) is a rookie Judge with strong ideals, always seeking fairness and becomes emotionally attached to victims she encounters. 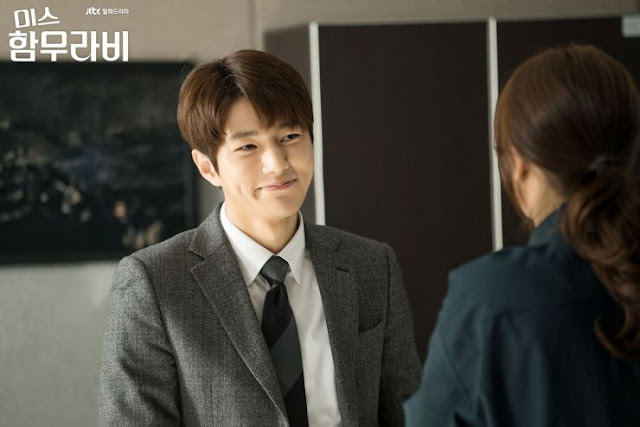 She runs into her former high school classmate, Im Ba Reun (Kim Myung Soo/INFINITE'S L) also a Judge appointed to the same bench. Unlike Oh Reum, he gives off an arrogant air and distances himself from people, believing that Judges should always consider the facts and act objectively. The two have to work with one another along with Chief Judge Han Se Sang (Sung Dong Il) who is a down to earth Judge with a hot temper and mean demeanour. His knowledge and experience of cases showcase his understanding of harsh realities, and define him as a Judge who's mean but never malicious. 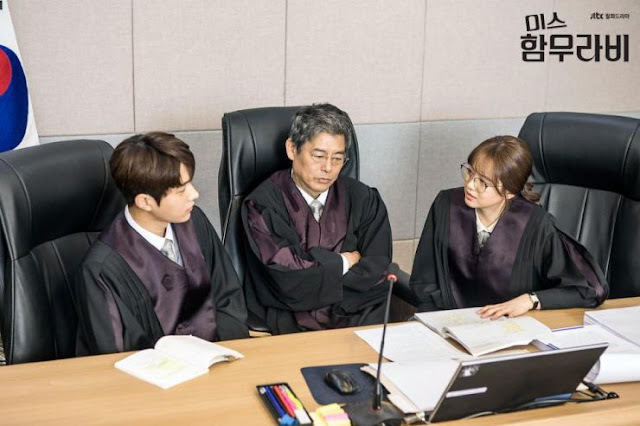 We're moving up the law hierarchy once again, a rarity since K-dramas like to explore the lives of Prosecutors and Lawyers a lot more but it's about time we get a realistic version of Judges. We're so used to seeing them as these god-like beings who proclaim a verdict and seal someone's fate, or as individuals too engrossed in corruption that it's horrifying or appalling. Don't get me wrong, I enjoy these tropes and depictions as well, but there's more to Judges than them being glamorized, superior-like, untouchable super humans in tv shows. 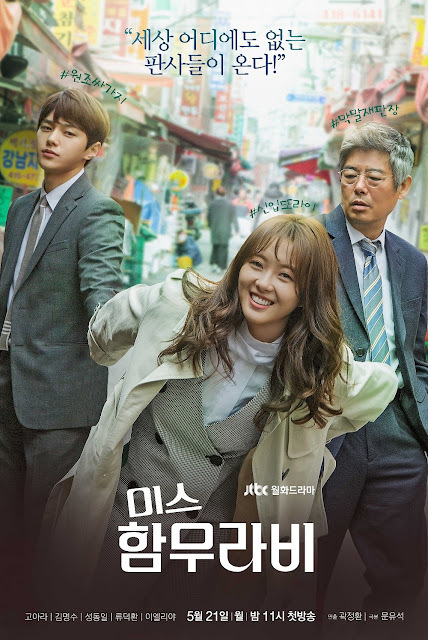 I think what Miss Hammurabi attempts at addressing with it's Judges is something we can all appreciate even if some people might find the drama too mundane and ordinary which is exactly what it tries to portray - the ordinary, everyday life of a Judge. It might not be as fascinating as the more fictionalized versions we're accustomed to, but it does offer a truthful representation and that in itself is daring since audiences like the romanticized type more. Our main characters aren't necessarily ones we've never seen in other dramas but it's interesting how their personal lives effect their notions of law and ethics. Oh Reum from various scenes, has completely changed from the docile and shy girl she was in high school to this quirky, Wonder Woman Judge so her past has moulded her into having the beliefs she upholds. It will be interesting to see the events from the past through flashbacks as the drama progresses because her character feels so much for people. The first episode gives us fragments of Oh Reum but we get a full course meal's worth of insight on Ba Reun as he opens and begins the episode, giving us his perspective. I personally love his internal dialogue as he painstakingly sits among people with this fictionalized interpretation of Judges or people he hardly knows that wish to use him to their advantage. He's an introvert to begin with, but his career as a Judge has further distanced him from others in his attempt to remain honourable. He disassociates himself because he thinks no one can have a real relationship with him without them wanting something in return, whether it's favours, solicitation, or middle aged housewives of the upperclass nominating him as a worthy candidate for their daughters. He shatters the idea that Judges are well-off, coming from homes full of wealth or free of any family issues since his life consists of debt and a dysfunctional family dynamic. His issues aren't even excessively dramatic because they're things normal people struggle with everyday, and on that note, I find his character compelling and relatable. He's a young ordinary man who tries to be just despite his personal problems. Rather than be a bore or extremely slow, the drama is languid in style and pace in order to capture a realistic story. It's light in the sense that it omits drama and even throws sarcastic puns around people watching far too many legal shows where Judges embody all this power. It's subject matter truly focuses on emotions and the disputes Judges have to settle in order to give us a humanistic story about a group of people who either seek an ideal or simply want to do their jobs without being fabrications of a societal image or media tropes. Its already expressed the inequality and gender issues women face and how Judges are as perceptible to the popular views held by a patriarchy, and even manages to critique world views through it's satire. So keeping that in mind, the little things in the drama are quite profound even if they might not appear that way. 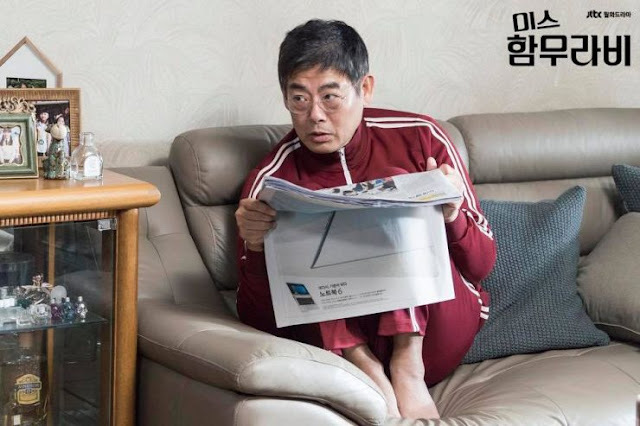 Sung Dong Il even stated that he prepared a long time for this role in order to convey the vivacity of real-life cases, and coming from him that gives us a good idea of what to expect. The actor is not only a veteran but has been in roles that are emotionally gripping, so his statement says a lot about the drama. The episode ends with a wall of certificates Ba Reun received while in school, the majority of them saying 'Good Boy' and that signifies him as being a good person even if his exterior says otherwise. People think he's unqualified to be a Judge because he lacks empathy but he's a good man with the right objectives. That being the case, it really is the small things that make up the drama. It deals with a lot of heavy material but includes humour, friendship, and hints of a romance, giving us a package deal instead of just one plot but the show isn't way over its head with all the other stories and subplots. The drama gives off the feeling that everything is timed and meant to be, so the subplots are naturalistic and aren't forced, becoming aspects for character growth. With a focus on life and reality, Miss Hammurabi is a warm and heartfelt drama about the everyday lives of Judges, and is sure to tug at your heartstrings. Thanks for the review. Honestly I was so sceptical when I saw the casting of Go Ara and L in the leads as judges no less but this seems to be getting a very positive response. Might give it a watch. I was skeptical at first as well because I thought it was ridiculous that they were casting such young actors as Judges. Turns out, it's quite possible to be a Judge even at the age of 25 so focusing solely on the acting they're doing well. 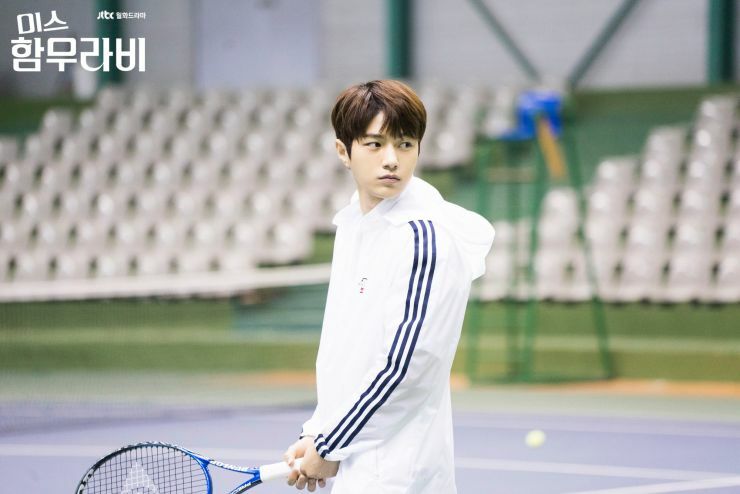 I just wish L would dig a little deeper into his character but I have no complaints with Go Ara so far. same, my first thought was they have awfully young judges. Loved your review and I had similar thoughts about the 1st ep. It's rather slice of life instead of being action pact with intense backstories and corruption scandals. It seems like a great drama to relax to. Slice of Life is a great way to describe it! And it's more of soft-melo legal drama of sorts, a good way to get a break from all the intense shows currently airing. Plus it adds more variety. That's an amazing review. The drama is just indescribably wonderful. The monologues by Judge Im is just an amazing concept.Moreover, every episode they touch regarding issues that is happening in the society. And also they amazingly portrait two different persepctive one Judge Park and Judge I on a case. Conclusion a perfect drama!